Copal oro is a resinous substance that is obtained from a small tree native to the southwestern U.S. and Mexico. Better known as the “elephant tree” due to its unusual looking structure and growth habit, as a member of the torchwood family along with frankincense and myrrh. Like the resins produced by its relatives, copal oro is highly aromatic and commonly used alone or blended with other botanicals and burned as incense. Bursera microphylla or Copal oro is native to Northern Mexico, in the states of Baja California, Baja California Sur, Sinaloa, Sonora, and Zacatecas; and the Southwestern United States, in Southern California and Arizona—especially desert regions. Bursera microphylla is a small tree of the Burseraceae family with a thickened trunk and relatively small branching structure in comparison to the trunk size; it is semi-succulent and store water in the conductive and parenchymal tissues of the trunk, lower limbs, and wood. The leaves are alternate, without stipules, and are mostly once-pinnate or twice-pinnate but can be unifoliate or trifoliate in some species. It reaches up to 10 m (33 ft) in height and its bark is light gray to white, with younger branches having a reddish color. The light foliage is made up of long, straight, flat, legume-like leaves which are composed of paired leaflets. It flowers in rounded yellow buds which open into small, star-shaped, white or cream flowers. The fruit is a drupe containing a yellow stone. This tree stores water in its very thick trunk and lower limbs, which resemble the legs of an elephant, giving rise to the common name of Elephant Tree. The species was named for its tiny leaves; microphylla = small leaves. Its genus name, Bursera, honors botanist Joachim Burser (1583-1649). 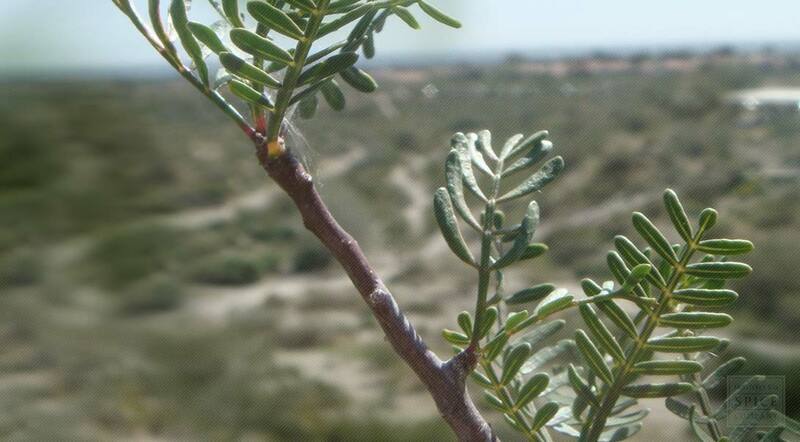 Bursera microphylla grows in desert regions in full sun, fairly drought tolerant and suitable for xeriscaping. It prefers warm south-facing slopes, rocky areas, and small desert canyons. It can withstand some freezing, but is limited in northward distribution by cold. Prefers a well-drained soil and very little irrigation—too much water and fertilizer promotes lanky unattractive growth. Propagate from semi-hardwood cuttings or from seed; direct sow outdoors in fall or in a greenhouse. Shallow diagonal cuts, made into the tree trunks, caused the sap to flow, dripping into a leaf ‘cup’ placed at the base of the tree. The resin was pounded into a thick paste and stored in large bowl shaped gourds. The resin was boiled and shaped into hard pellets for use as Copal. Store resin pellets in an airtight container in a cool, dry place.